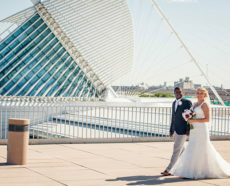 Jessica and Kristina came to our team in search of a beautiful Milwaukee lakeside locale to match their wedding vision. With a gorgeous view and remarkable accommodating event spaces like the Miller Room and Coast, Zilli Lake & Gardens is an absolute dream wedding venue that this couple fell in love with right away. 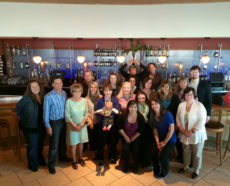 We were excited to show them the space and bring their vision to life in its one-of-a-kind atmosphere. 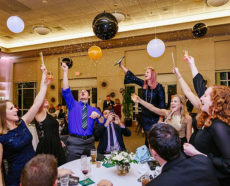 Here are some of our favorite highlights of the event from the storybook photos captured by Alex de Fleron Photography. 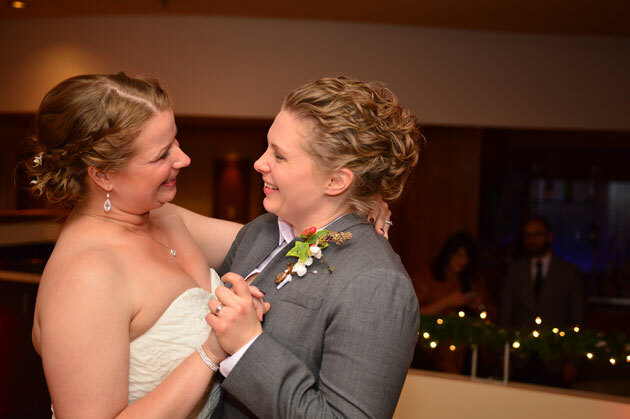 Jessica & Kristina’s wedding welcomed 136 guests. Our on-site staff in professional attire made this special evening stress-free, allowing the couple to enjoy each other and their company without worry. Guests began arriving around 5:30PM. They were welcomed by a greeting table with some clever initial accents. 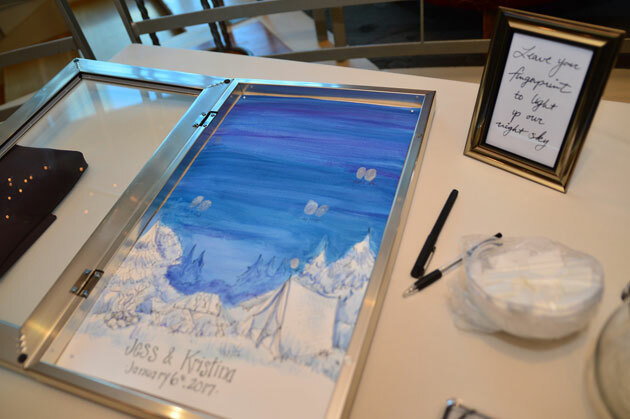 Our design team from Adorn contributed a lovely “fingerprint tree” concept where guests were encouraged to sign with their fingerprints and create a tree design to “light the night sky” for the couple. It made the experience that much more personal because the families and friends got to actually play a part in setting the tone for the evening. 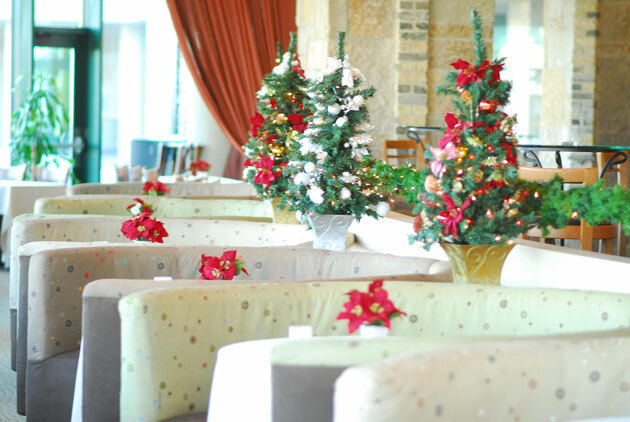 The dance floor (elegantly decorated with suspended lighting) inside Coast Restaurant hosted the ceremony. The interior is sizable enough to accommodate up to 400 guests. 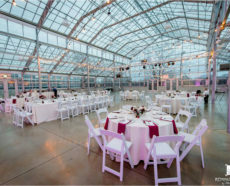 It provided a large space with a welcoming atmosphere and spectacular outdoor views of the lake. The venue was everything the couple asked for in a backdrop to exchange their vows and commemorate the occasion in pictures. While typically chilly in January, this Milwaukee evening was abnormally balmy for the couple’s special day. 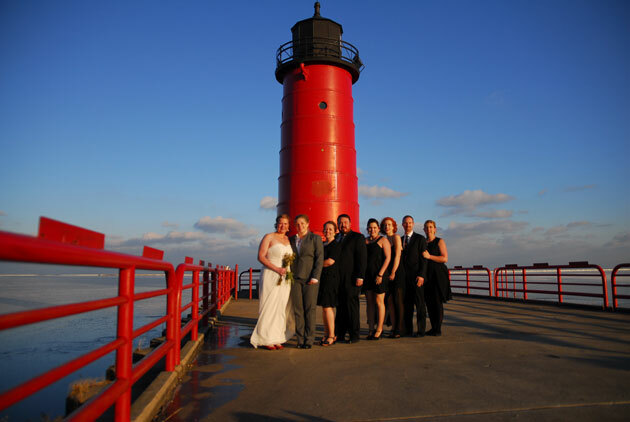 It allowed them to enjoy the full splendor of the venue together and capture it in photos, including several magnificent shots of the Pier Wisconsin and lighthouse. Once the ceremony concluded, the restaurant transformed into an amazing reception space. 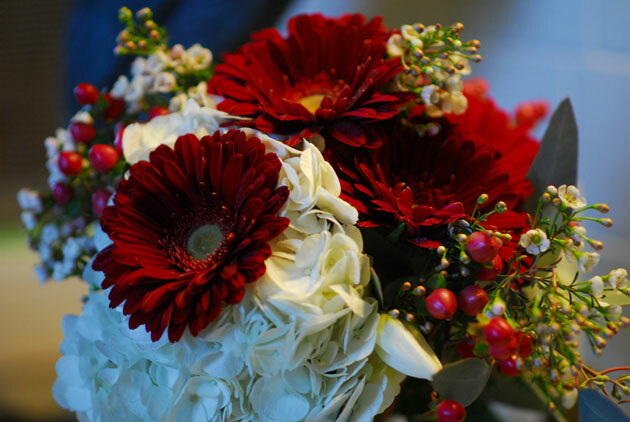 Tables were decorated with assorted red poinsettia and holly florals (a seasonal favorite and perfect design complement for this wedding) courtesy of Larry Fisk. Our creative culinary team really went above and beyond in creating this couple’s spectacular menu. They filled it with platinum package set hors d’oeuvres, dinner stations and dessert selections. Market pita: roasted red pepper hummus and sun dried tomato-olive tapenade mixed with feta cheese atop a crisp pita chip. Garnished with pickled cucumbers. Tomato, bocconcini and basil skewer: cherry tomato, bocconcini and fresh basil laced with a balsamic glaze served on a skewer. Tenderloin forks roasted tomato & horseradish: tenderloin with roasted tomatoes, crisp onions and horseradish cream. Quinoa shooter with roasted vegetables: quinoa salad with roasted vegetables and Italian vinaigrette in a votive glass. Artichoke, asiago and sun dried tomato purse: artichoke hearts, asiago cheese and sun dried tomato blended with cream cheese. Baked in a puff pastry. Micro chicken pot pie: diced chicken in a creamy chicken stock. Accompanied with peas, carrots and potatoes seasoned with garlic and pepper. Topped with a light, flaky crust. Mini roasted potato w/ braised short ribs: mini roasted potatoes filled with braised short ribs. Topped with pommes royale and buttered peas. Pumpernickel pizza square: pumpernickel cocktail bread with a meat and cheese sauce topping. Bacon-wrapped chicken with princess glaze: seared chicken breast seasoned with garlic, thyme and pepper wrapped in bacon. Served with a cranberry-scented princess glaze. 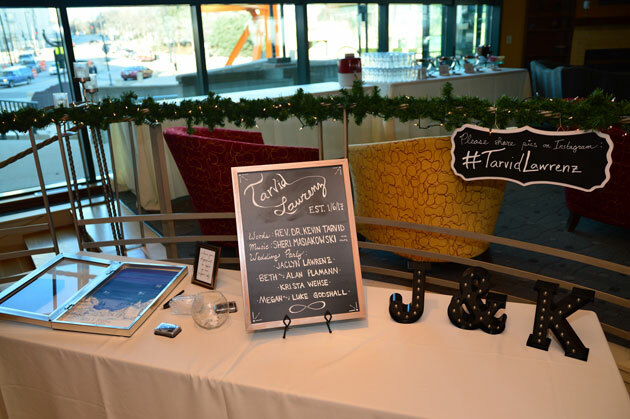 Guests were treated to two chef-prepared dinner stations and a late-night snack station. KC-BBQ “Dinner in a Glass” station: slow roasted BBQ pulled pork. Served over poblano and cheddar potato shred. Topped with a colorful, tangy coleslaw. Fresh market station: Fresh seasonal fruits, Wisconsin cheeses, assorted crackers and grilled vegetables with a cilantro dip. Late-night macaroni and cheese station: elbow noodles blended with a creamy cheese sauce. Guests select their own toppings from smoked sausage, diced chicken, steamed broccoli, bacon bits and salsa. And the miniature dessert selections had something for everyone. Chocolate mousse votives: creamy chocolate mousse topped with shaved chocolate. Creme brulee cup: rich egg and vanilla bean custard baked in mini cups and topped with caramelized sugar. Mini red velvet cupcakes: moist red velvet miniature cupcakes with white frosting. Mini s’mores cupcakes: mini chocolate cupcakes topped with chocolate frosting, graham cracker dust and a mini marshmallow. Beers included domestic brews like Miller and Spotted Cow. A Lakefront IPA was also added to complement the lakeside concept. After dinner, the dance floor at Coast came alive. The team from Smoov Music Services turned up the tunes and got everyone out of their seats and moving. An elegant wedding venue turned into a club-like party where guests were dancing late into the night. 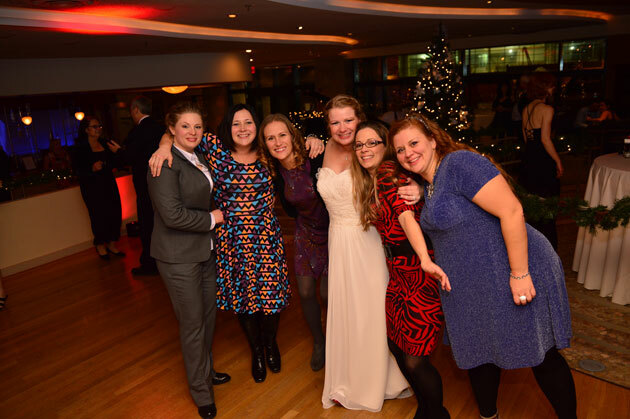 When all was said and done, the atmosphere at Jessica & Kristina’s wedding made the evening incredibly special. It was a memorable night of friends and family coming together to celebrate Jessica and Kristina’s love in an iconic spot on the shores of Lake Michigan. Our team was honored to be part of it, and we cherish the opportunity to do it for every Milwaukee couple that comes our way. Contact our experts here or via phone at 262.547.9447 to discuss your wedding dreams at Zilli Lake & Gardens, Coast or one of our other Milwaukee wedding venues today.